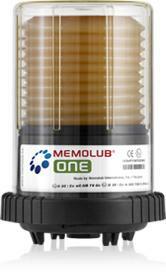 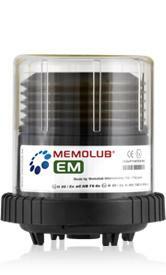 MEMOLUB® EM is a single point autonomous refillable lubricator Its ejection pressure of 10 Bar opens a wide new range of application not accessible with conventional lubricators Remotely installed, it can be used up to two meters from the lube point MEMOLUB® EM is the perfect solution for a regular micro-lubrication. 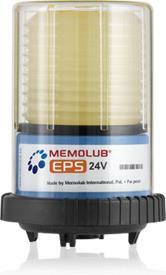 Its 120cc content and 0.15 or 0.30cc daily output makes it the ideal lubricator for application requiring little daily lubricant quantities. Setting 12 or 24 months (see technical data’s). With its 10 bar pressure, it can be remotely installed up to 2 meters at 0°C -Certified ATEX – EX zone 22.